Walter Langley (1852–1922), A Village Idyll (1888), watercolor, 75 × 120.5 cm, location not known. Wikimedia Commons. When I was a boy, one of my great delights was travelling on the Cornish Riviera Express, one of several scheduled train services that run from London’s Paddington railway station to the far south-western end of Britain. The term Cornish Riviera always evoked holidays on warm beaches, the closest that the UK gets to the Mediterranean. If you overlook the rain, that is, and the usually only modest warmth. Cornwall is unique within England as being the only county with its own language – Cornish, a Celtic language which is currently being revived – and a coastline more similar to those of north Wales or the more rugged parts of Scotland. Being a peninsula, even when you are on Bodmin Moor, its wildest land, you are never far from the sea. For more than a century, it has also supported the most active artists’ colonies and communities outside London, with its own branch of the Tate Gallery, and one of the largest art schools at Falmouth University. When the great landscape painters of the early nineteenth century visited Cornwall, though, there was only the coast, an extensive fishing industry, and the Cornish. Travelling from London was slow and hazardous until Isambard Kingdom Brunel’s Great Western Railway reached Plymouth in 1849, and finally in 1867 enabled rail travel from the heart of London all the way to Penzance (originally via the Cornwall Railway, and West Cornwall Railway). My Favourite Cornish Riviera Express was not inaugurated until 1904, and then took just seven hours for the entire route. 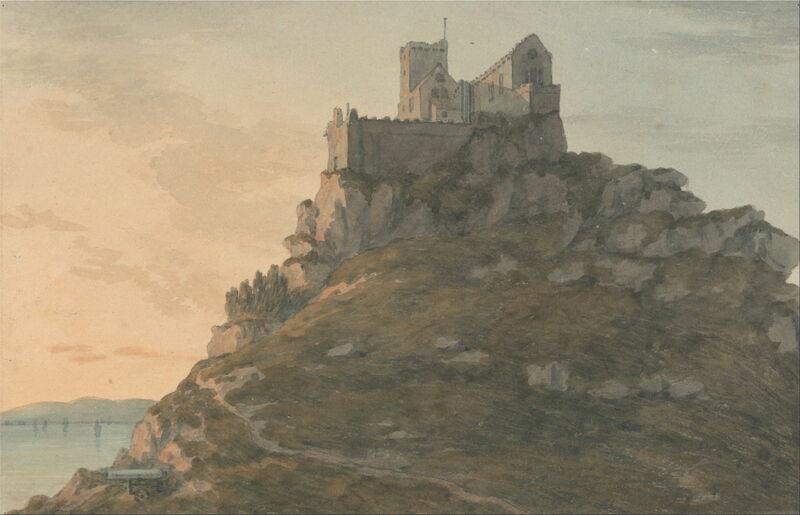 John Warwick Smith (1749-1831), Saint Michael’s Mount, Cornwall (date not known), watercolor over graphite on medium, slightly textured, cream wove paper, 21 x 35.2 cm, Yale Center for British Art, New Haven, CT. Wikimedia Commons. 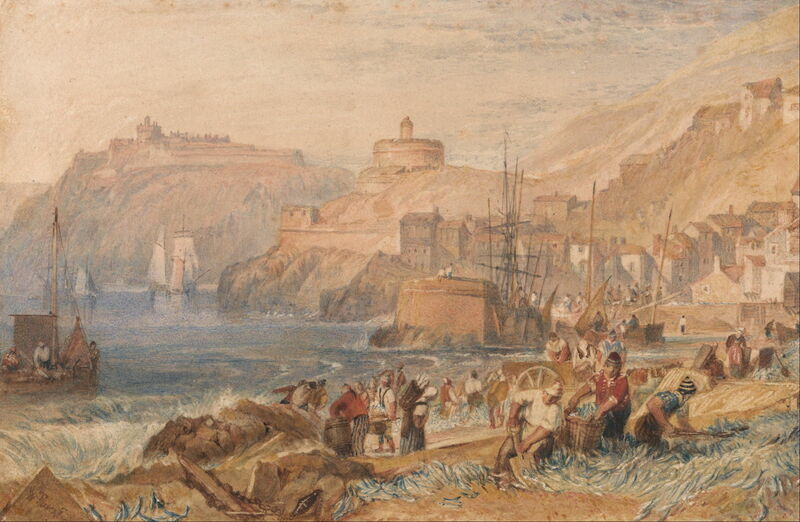 John Warwick Smith (1749-1831) was a popular topographic painter, whose undated watercolour of Saint Michael’s Mount, Cornwall is one of the earliest artistic depictions of this location. Saint Michael’s Mount is a small rocky island attached to the mainland by a tidal causeway. It is strikingly similar in many respects to its sister, on the other side of the Channel, Mont St Michel. Peter De Wint (1784-1849), Seascape with Rocks, The Lizard, Cornwall (date not known), watercolor over graphite on thick, cream, moderately textured wove paper, 30.2 x 44.5 cm, Yale Center for British Art, New Haven, CT. Wikimedia Commons. 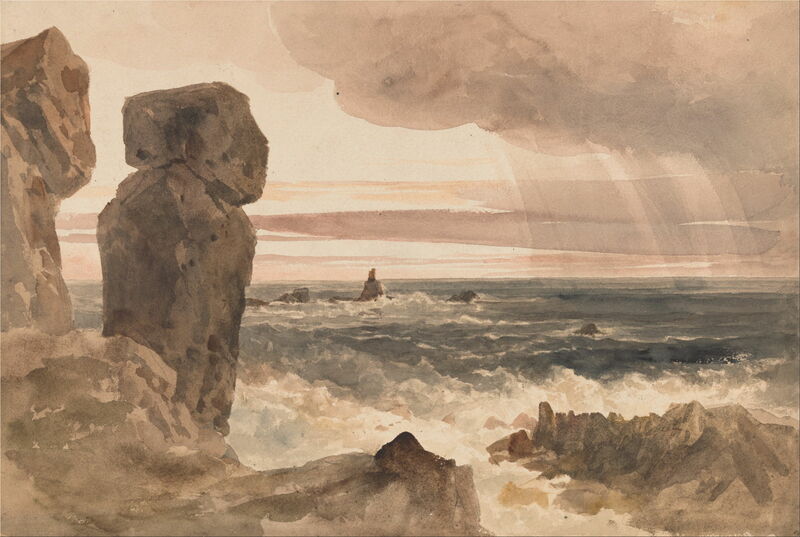 Peter De Wint’s undated watercolour Seascape with Rocks, The Lizard, Cornwall was probably painted around the turn of the century (1800), and shows rough and showery weather on the coast of the Lizard peninsula, which reaches south into the exposed waters of the Western Approaches. De Wint has only relatively recently been ‘re-discovered’ as a major landscape artist, after more than a century of neglect. JMW Turner (1775–1851), St. Mawes, Cornwall (c 1823), watercolor, 14.3 x 21.9 cm, Yale Center for British Art, New Haven, CT. Wikimedia Commons. JMW Turner toured the West Country, reaching down into Cornwall, in 1811, and the Tate Gallery has a 90-page sketchbook which records many views of the Cornish coast from that visit. He later developed several of them into fine oil paintings, although it is unclear whether this watercolour of St. Mawes, Cornwall, from about 1823, had its origins in those sketches and studies. As with some of his paintings of other coastal areas, Turner shows a fishing boat coming in to a beach to land its catch, and the great activity in the open air fish market in the foreground. Behind are typical Cornish cottages stepped up from the shore to the top of the coastal cliffs, and the castles of St Mawes (closer) and Pendennis, in Falmouth (more distant, on the other side of the estuary). 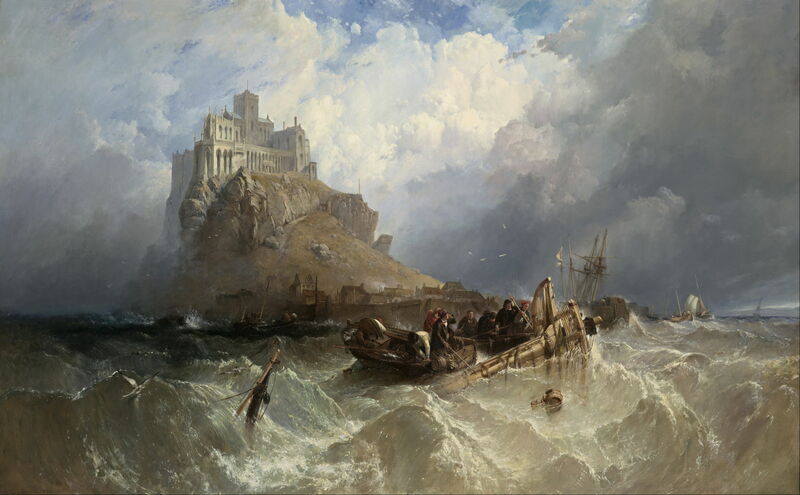 I have already shown Clarkson Stanfield’s dramatic painting of Mount St Michael, Cornwall from 1830, which must be one of the most impressive depictions of this location. 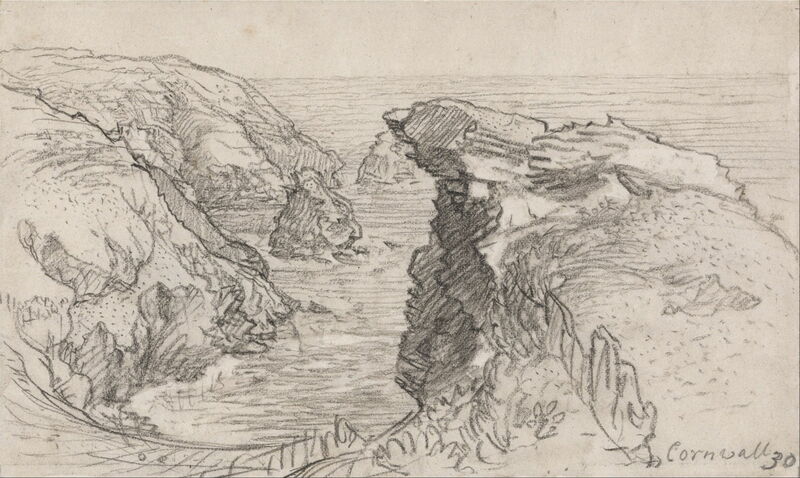 Samuel Palmer (1805–1881), A Page from a Cornish Sketchbook: Cornwall 30 (date not known), black chalk and graphite on medium, smooth, white wove paper, 10.6 x 17.8 cm, Yale Center for British Art, New Haven, CT. Wikimedia Commons. More usually known for his distinctive paintings of Kent, Samuel Palmer toured the West Country and Wales in 1835, and probably produced his Cornish sketchbook at that time. This black chalk and graphite sketch of the Cornish coast gives an excellent feel for its ruggedness. Sadly, I have been unable to locate any images of developed paintings made from these sketches, but he appears to have referred to them in much later works, such as the coastline in his Old England’s Sunday Evening (1874), below. Samuel Palmer (1805–1881), Old England’s Sunday Evening (1874), watercolour over pencil, heightened with bodycolour, scratching out and gum arabic, 30 × 70 cm, Private collection. Wikimedia Commons. With the coming of the railway in the late nineteenth century, the previously remote and almost unknown coast of Cornwall was within easy reach of anyone who could afford the time and fare. Painters started to visit, then settle, in significant numbers. The Swedish painter Anders Zorn, for example, based himself in St Ives, and toured the rest of Cornwall, in 1887-88. Among the works which he painted there is his watercolour of the Fish Market in Saint Ives (1888) shown below. 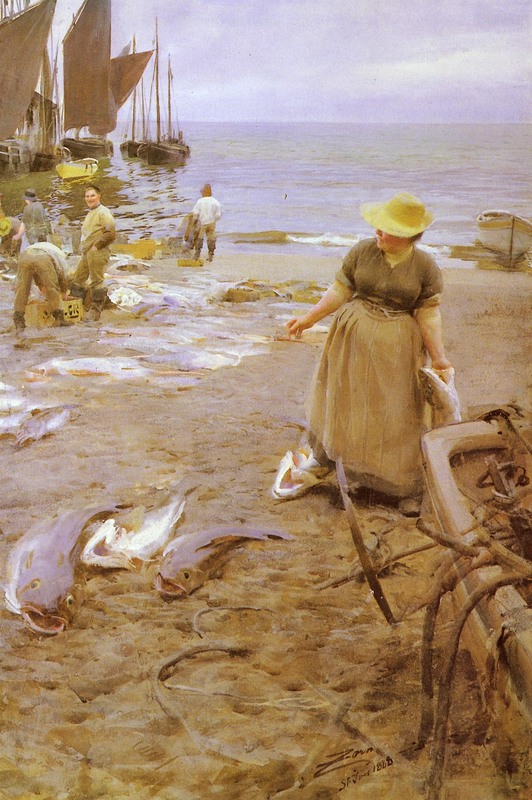 Anders Zorn, Fish Market in Saint Ives (1888), watercolour, 100 x 76.5 cm, Private collection. Wikimedia Commons. At about this time, artists from London were moving out from the city to the fishing village of Newlyn, near Penzance. This colony has become known as the Newlyn School, and had parallels with the Barbizon School in France, although much later, of course. Newlyn enjoyed excellent light for much of the year, was much cheaper to live in than London, and its models were also inexpensive. 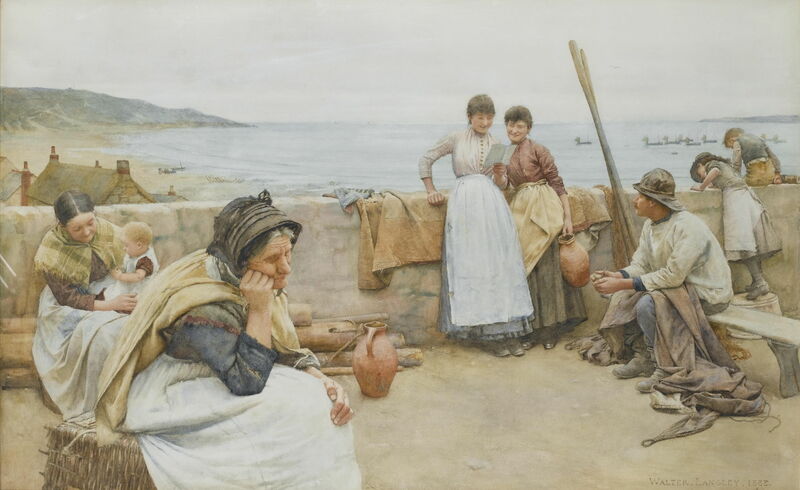 Among the first, and usually credited as the founder, of the Newlyn School was Walter Langley, who set a common theme of the fishing community, much in the same way that Winslow Homer had done at Cullercoats just a few years earlier. Langley’s watercolour A Village Idyll from 1888 gives a good idea of the type of motif which became popular. George Gordon Byron Cooper (1850-1933), Nature’s Garden, Cornwall, or Kynance Cove, Cornwall (date not known), watercolour, 35.6 x 55.9 cm, location not known. Image by Wiganwoking, via Wikimedia Commons. George Gordon Byron Cooper was from Manchester, and didn’t settle in one of the growing colonies in Cornwall. 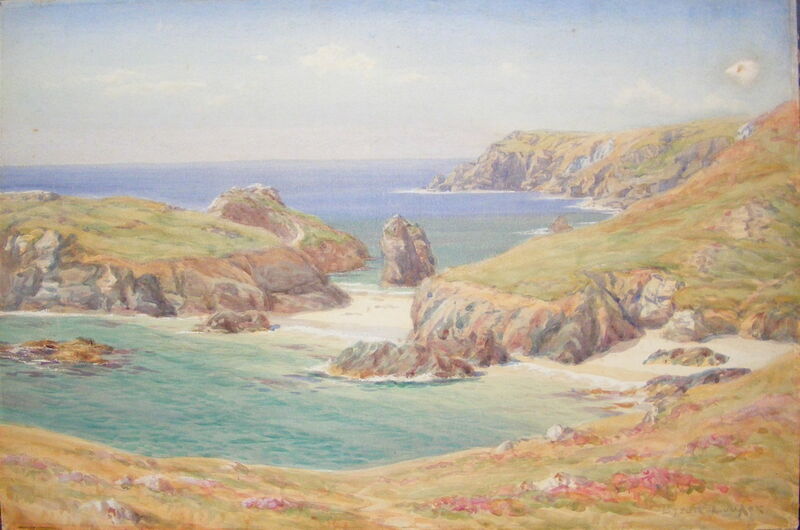 His undated watercolour Nature’s Garden, Cornwall, or Kynance Cove, Cornwall shows this beauty spot and sheltered beach on the western side of the Lizard peninsula, during a summer tour. Norman Garstin (1847-1926), A View Of Mount’s Bay (1892), oil on panel, 26 x 19 cm, location not known. Wikimedia Commons. Norman Garstin was born in Ireland, trained in Antwerp and Paris (under Carolus-Duran), and joined the Newlyn School in 1886. 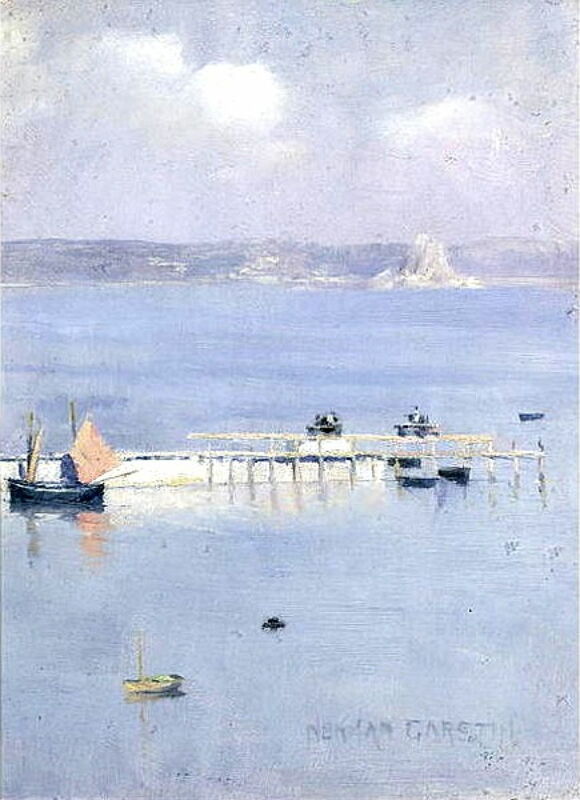 His View Of Mount’s Bay (1892) was almost certainly painted en plein air, and shows the bay in which St Michael’s Mount is situated, although that is far distant. Mount’s Bay is the largest in Cornwall, and stretches from the Lizard at the east to Gwennap Head at the west, which is south of Land’s End. This view looks east from the western side of the bay. Henry Meynell Rheam (1859–1920), Newlyn Harbour (1894), watercolour, 15 x 28 cm, location not known. Wikimedia Commons. Henry Meynell Rheam was a less well-known member of the Newlyn School, and also came to it after training in Europe. He was born in Birkenhead, then went to Germany and the Académie Julian in Paris. 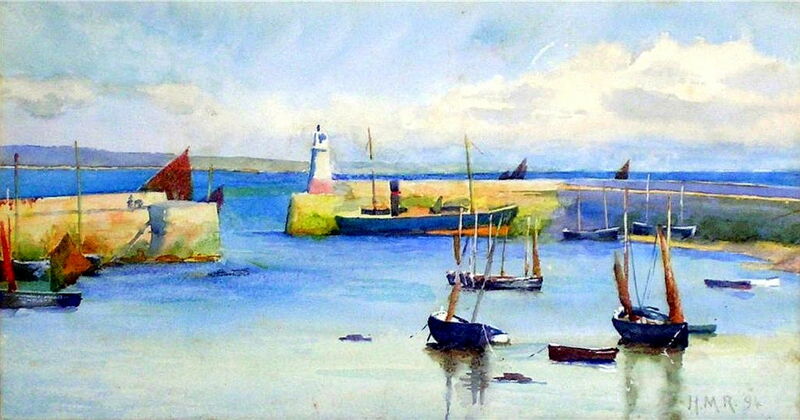 This watercolour of Newlyn Harbour was painted in 1894, and is high in chroma compared to many of the landscapes of this school. Abbott Handerson Thayer (1849–1921), Cornish Headlands (1898), oil on canvas, 76.5 x 101.9 cm, Smithsonian American Art Museum, Washington, DC. Wikimedia Commons. The fame of the artists’ colonies in Cornwall spread internationally. In 1898, Abbott Handerson Thayer travelled from the East Coast of the US with a letter of introduction requesting permission to collect specimens of birds from the cliffs around St Ives. 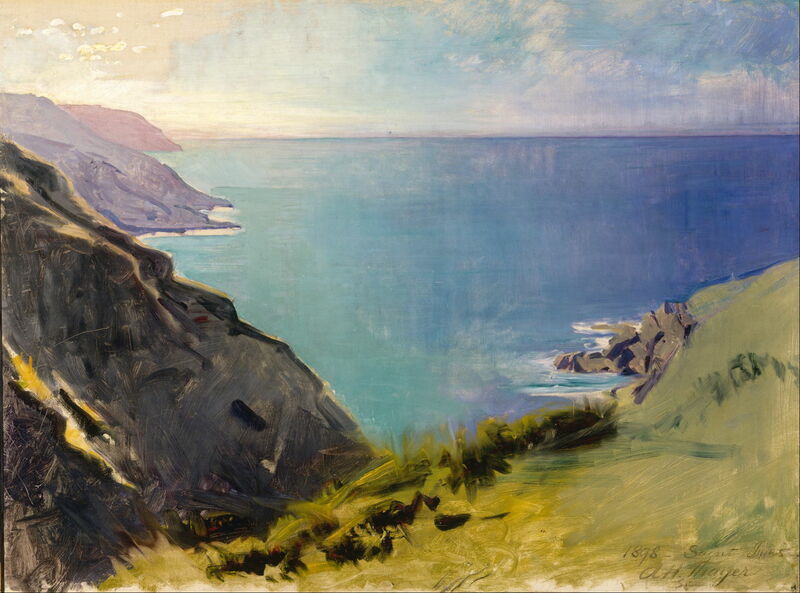 When not collecting those specimens, he painted views such as Cornish Headlands (1898). The next article will look at paintings of the Cornish coast in the early twentieth century, when it found even greater fame. The Newlyn School on Wikipedia. Posted in General, Life, Painting and tagged coast, Cooper, De Wint, Garstin, landscape, Langley, painting, Palmer, Rheam, Smith, Stanfield, Thayer, Turner. Bookmark the permalink.